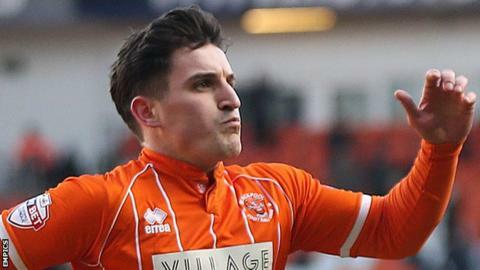 Gillingham missed the opportunity to go top of League One as Jack Redshaw's penalty earned Blackpool victory. With Burton losing 2-1 at Rochdale the Gils would have gone top, but instead Redshaw moved Blackpool five points clear of the relegation zone. The only goal came when Mark Yeates was fouled by Max Ehmer in the area and Redshaw slotted home from the spot. Tom Aldred cleared an Ehmer strike off the line as Blackpool held on to record a third consecutive home clean sheet. The result means Gillingham stay second, three points behind Burton, while Blackpool move up to 18th. Match ends, Blackpool 1, Gillingham 0. Second Half ends, Blackpool 1, Gillingham 0. Uche Ikpeazu (Blackpool) wins a free kick in the attacking half. Substitution, Blackpool. John Herron replaces David Norris because of an injury. Corner, Blackpool. Conceded by Aaron Morris. Attempt missed. Danny Philliskirk (Blackpool) right footed shot from outside the box is close, but misses to the left. Attempt missed. Brad Potts (Blackpool) right footed shot from the right side of the box is high and wide to the right. Attempt missed. Brennan Dickenson (Gillingham) left footed shot from outside the box misses to the right. Corner, Gillingham. Conceded by Will Aimson. Attempt blocked. Bradley Dack (Gillingham) right footed shot from outside the box is blocked. Substitution, Gillingham. Elliott List replaces Dominic Samuel. Corner, Blackpool. Conceded by Doug Loft. Substitution, Blackpool. Clark Robertson replaces Jack Redshaw. Attempt missed. Jack Redshaw (Blackpool) right footed shot from the centre of the box is close, but misses the top right corner. Corner, Gillingham. Conceded by Danny Philliskirk. Attempt blocked. Aaron Morris (Gillingham) right footed shot from the centre of the box is blocked. Attempt blocked. Max Ehmer (Gillingham) right footed shot from the centre of the box is blocked.